Schizophrenia is a mental disorder characterized by strong psychotic episodes of hallucinations and delusions, which affects, according to statistics, 1% of the world population. Although its pathogenesis remains unknown, multiple investigations suggest that several associations of chromosomal locus are responsible in the neurodevelopment of the disorder. This polygenic theory, shared by diseases such as cancer and diabetes, can also be influenced by environmental and epigenetic factors. Despite the existence of antipsychotic drugs that partially control the disease, these in many cases suppose counterproductive and ineffective effects. That is why a new research line on epigenetic factors and chromosomal associations, linked to the disorder origin, could lead to new pharmacological treatments that represent a real breakthrough. Keywords: schizophrenia, candidate’s genes, locus, dopamine, drugs, neurodevelopment, models. La esquizofrenia es un trastorno mental caracterizado por sus fuertes episodios psicóticos de alucinaciones y delirios, el cual afecta, según las estadísticas, al 1% de la población mundial. Aunque su patogénesis sigue siendo desconocida, múltiples investigaciones apuntan que varias asociaciones de locis cromosomales tienen relevancia en el neurodesarrollo del desorden. Esta teoría poligénica, la cual comparten enfermedades como el cáncer y la diabetes, también puede estar influenciada por factores ambientales y epigenéticos. A pesar de la existencia de fármacos antipsicóticos que controlan la enfermedad parcialmente, estos suponen en numerosos casos efectos contraproducentes y poco eficaces. Es por ello que una nueva línea investigativa sobre factores epigenéticos y asociaciones cromosomales, ligados a su origen, podrían conducir a nuevos tratamientos farmacológicos que supongan un verdadero avance. Palabras Clave: esquizofrenia, genes candidatos, locus, dopamina, fármacos, neurodesarrollo, modelos. The purpose of the present article is to analyze multiple works and investigations about the different genes involved in the malformation of the CNS. Also, to explain the interaction of these genes with the disease and discuss the repercussion of alterations in the genome by epigenetic and environmental factors. Another objective of the article is to present the current molecular mechanisms that rule schizophrenia. We’ll discuss the main actual molecular treatments applied to schizophrenia, make a comparison between the different techniques and present them according to their performance and efficiency. And finally, the effects of cannabis use on schizophrenia will be introduced and discussed. Monogenic model: Which shows that all types of schizophrenia share the same gene but with a different level of penetration. The fact that only between 30% and 35% of the offspring of schizophrenic patients develop the pathology discredits this model. Heterogenetic Model: It defines schizophrenia as a set of pathologies, associated with a greater locus, which are transmitted by inheritance, either dominant, recessive or linked to the X chromosome. However, there is insufficient data or analysis in favour of this hypothesis. Figure 1.- Chromosomal map with the locations of genes, marked with a red strip, related to some susceptibility to schizophrenia disorder, as Harrison P and Owen M. mentioned on their work. 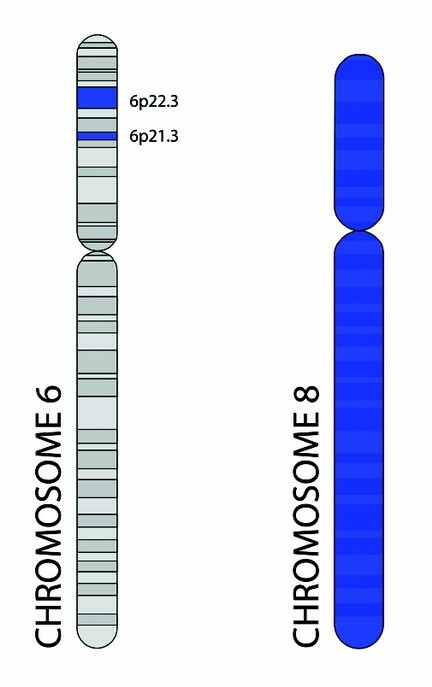 Figure 2.- Chromosome 6 showing the locations of NOTCH4 gene and Dysbindin Protein 1 gene, marked with a blue strip, and chromosome 8. We can say that, despite the great amount of studies and analysis about the complexity of genetics that presents the development of schizophrenia, is still unknown how the implicated molecular mechanisms are. It is considered that the most acceptable form to analyze the pathogenesis is with a serie of major and minor contributions from a set of locus associated with multiple chromosomes. This idea of multiple genetic contributions conforms the polygenic model, which seems to be a model that explain the etiology of the schizophrenic spectrum. On the other hand, there is also enough evidence to propose the existence of a linkage between the development of the disease and the ambiental and epigenetic factors. Other alleged responsibles of the development of the disease, is the consume of cannabis, which effect in nervous system play a big role in the etiology of the disorder. Even though it’s not discovered yet the precise relationship between cannabis and schizophrenia, it is proved that its consumption means a risk factor for the onset of schizophrenia. Another important approach that have to be taken into account in the study of schizophrenia is the behaviour of patient in the society. This allow to analyze thoroughly the epigenetic factors that are involved in the development of the disorder and which of them participates on the genetic heritability. Finally, there are still a few lines of researching, where molecular techniques supposed to be a progress against the illness. In other words, techniques that support directly the profound study of the chromosomal linkages and obtain new successful pharmacological treatments from that analysis. Furthermore, emerging investigations about genetic mechanisms could reveal new manners of pharmacologic development, and could even reach the generation of a model for polygenic diseases treatments. This could suppose a strong social advancement if we consider that, nowadays, drugs used such as chlorpromazine, risperidone and clozapine, which are antagonists of antidopaminergic and antiserotonergic receptors, have secondary perjudicial and counterproductive effects for the patients. Principally, the chlorpromazine, which often presents a setback for the schizophrenia treatment. Antipsychotics have been of great utility, yet their counter effects lead us to continue studying the nature of schizophrenia, its causes and its repercussions. Due to the large number of chromosomal associations that this disease presents, it is difficult to find candidate genes from which to hypothesize that its regulation prevents the development of the disease or even manages to cure it. Although it is practically a fact that certain environmental changes and epigenetics play a very important role in the birth of the disease, there are still few studies about the influence and what types of epigenetic mechanisms are responsible for schizophrenia. It should be noted that even knowing that genomics has a lot to do with the malformation of the CNS, which leads to the development of disorder, there are few investigations applying molecular techniques different from drugs for its treatment. There are few AP that perform in instances a serious regulation on schizophrenic patients, they are still an inefficient and expensive way of treating the disease. Association between cannabis use and schizophrenia is not completely determined yet because there are different results when trying to identify the type of relation, nevertheless it is a fact that cannabis has several implications on the development of such disorder. 1. Aguilar Á. Identificación de factores genéticos en la etiología de la esquizofrenia. Sistema de Información Científica Redalyc. 2011 July; 16(3). 2. Gejman P, Sanders A. La etiología de la esquizofrenia. 2012; 72(3). 3. Giménez C. Bases moleculares de la esquizofrenia. 2012 November . 4. Mediavilla J. Esquizofrenia. Londres: Royal College of Psychiatrists, Consejo Editorial de Educación Pública; 2009. 5. Tamminga CA. The promise of new drugs for schizophrenia treatment. 1997 April; 42(3). 6. Power R, Verweij K, Zuhair M, Montgomery G, Henders A, Heath A, et al. Genetic predisposition to schizophrenia associated with increased use of cannabis. Molecular Psychiatry. 2014 June; 19. 7. Salamanca D, Vergara J, Escobar FRÁ, Caminos J. Avances genéticos y moleculares en el estudio de trastornos mentales. Revista Facultad Medica. 2014; 62(2). 8. Sacchi S, Rosini E, Pollegioni L, Molla G. D-Amino Acid Oxidase Inhibitors as a Novel Class of Drugs for Schizophrenia Therapy. Current Pharmaceutical Design. 2013; 19. 9. Obiols J, Vicens-Vilanova J. Etiología y Signos de Riesgo en la Esquizofrenia. International Journal of Psychology and Psychological Therapy. 2003; 3(2). 10. Consenso Nacional y Guía de Práctica Clínica de la Asociación Psiquiátrica Mexicana y de la Asociación Psiquiátrica de América Latina para el tratamiento de las personas con esquizofrenia. Salud Mental. 2014;37(1):VII-118. 11. Obiols J, Carulla M. Bases biológicas de la esquizofrenia: Aspectos Neuroquímicos y Neuroanatómicos. 1998; 6(1). 12. Yrjö A. LA ESQUIZOFRENIA. In Sanz ME, editor. LA ESQUIZOFRENIA: Sus Orígenes y su Tratamiento Adaptado a las Necesidades del Paciente. Madrid: Editorial H. Karnak Ltd.; 2003. p. 23-37. 13. Wang Q, Ji W, He K, Li Z, Chen J, Li W, et al. Genetic analysis of common variants in the ZNF804A gene with schizophrenia and major depressive disorder. 2017 September; 27. 14. Harrison P, Owen M. Genes for schizophrenia? Recent findings and their pathophysiological implications. Lancet. 2003 February ; 361. 15. Bolaños S. Análisis epistémico del modelo biológico para explicar el origen de la esquizofrenia. Sistema de Información Científica Redylac. 2003; 19(106). 16. O'Tuathaigh C, Moran P, Zhen X, Waddington J. Translating advances in the molecular basis of schizophrenia into novel cognitive treatment strategies. 2017 October; 174(19). 17. Morris B, Pratt J. Novel treatment strategies for schizophrenia from improved understanding of genetic risk. 2014 November; 86(5). 18. Howes O, et al. Treatment-Resistant Schizophrenia: Treatment Response and Resistance in Psychosis (TRRIP) Working Group Consensus Guidelines on Diagnosis and Terminology. The American Journal of Psychiatry. 2016 December; 174(3). 19. Valiente A, Lafuente A, Bernardo M. Revisión sistemática de los Genomewide Association Studies (GWAS) en esquizofrenia. Revista de Psiquiatría y Salud Mental. 2011 September; 4(4). 20. Harrison P, Weinberger D. Schizophrenia genes, gene expression, and neuropathology: on the matter of their convergence. Nature. 2005; 10. 21. Pacheco A, Raventós H. Genética de la esquizofrenia: avances en el estudio de genes candidatos. Revista de Biología Tropical. 2004 September; 52(3). 22. Xavier RM, Vorderstrasse A, Keefe R, Dungan J. Genetic correlates of insight in schizophrenia. Elsevier. 2017 October. 23. Saiz J, de la Vega D, Sánchez P. Bases Neurobiológicas de la Esquizofrenia. Clínica y Salud. 2010; 21(3). 24. Ovendena E, McGregora N, Emsleyb R, Warnicha L. DNA methylation and antipsychotic treatment mechanisms in schizophrenia: progress and future directions. 2017 October;(17). 25. Graff A, Apiquian R, Fresán A, García M. Perspectiva neurobiológica de la esquizofrenia. Sistema de Información Científica Redalyc. 2001 December; 24(6). 26. Wooley DW, Shaw E. A biochemical and pharmacological suggestion about certain. Proceedings of the National Academy of Sciences. 1954 April; 40(4). 27. Cabildo A, González M, Hernández M, Quintanar V, Sayago A. Diseño basado en quimioinformática y estudios de acoplamiento molecular de análogos de Clorpromazina para disminuir los efectos secundarios en el tratamiento de la esquizofrenia. 2016; 3(1). 28. Tajima K, Fernández H, López-Ibor JJ, Carrasco J, Díaz-Marsá M. Tratamientos para la esquizofrenia. Revisión crítica sobre la farmacología y mecanismos de acción de los antipsicóticos. Actas Esp Psiquiatría. 2009; 37(6). 29. Ghafelehbashi H, Kakhki M, Kular L, Moghbelinejad S, Ghafelehbashi S. Decreased expression of IFNG-AS1, IFNG and IL-1B inflammatory genes in medicated Schizophrenia and Bipolar patients. 2017 October. 30. Shi Y, Li M, Song C, Xu Q, Huo R, Shen L, et al. Combined study of genetic and epigenetic biomarker risperidone treatment efficacy in Chinese Han schizophrenia patients. Nature. 2017 May; 7. 31. Barzotti F. Pharmacogenetics in schizophrenia: a review of clozapine studies. Revista Brasileira de Psiquiatría. 2013 September; 35(3). 32. Ferdinand R, Sondeijker F, van der Ende J, Selten J, Huizink A, Verhulst F. Cannabis use predicts future psychotic symptoms, and vice versa. Addiction. 2005 May; 100(5). 33. Fergusson D, Horwood L, Ridder E. Tests of causal linkages between cannabis use and psychotic symptoms. Addiction. 2005 March; 100(3).